Every time I make this I think, “This is so good and easy to make. I should put it on the menu more often!” Basically this a chopped up medium onion, 2 cloves of minced garlic, and 1/2 T. of minced ginger sautéed in some oil or butter. Add 1 cup of picked over and rinsed red lentils and 2 1/2 cups of stock. Bring to a boil and simmer until the lentils are softened, about 15 minutes. Ta da, you are done except for making sure the seasoning is right. It is quite soupy and very delicious. You can put a swirl of yogurt on it or not. The salad is baby kale and cucumbers with chickpeas that I jazzed up with some onions and sumac, cumin, red pepper, and garlic powder. It is simply dressed with a little olive oil and vinegar. Pita makes a nice accompaniment. 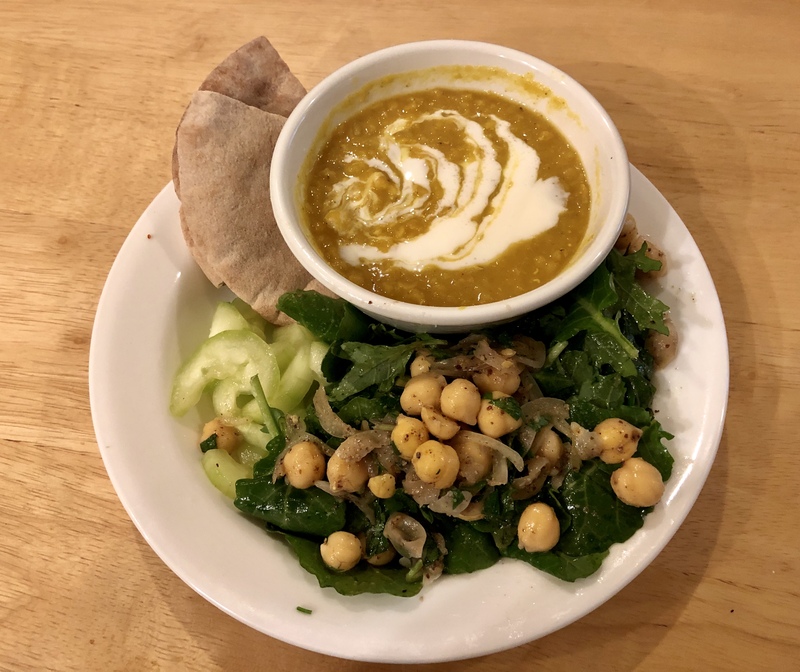 This entry was posted in Easy, Legumes, Recipes, Vegan, Vegetables and tagged chickpeas, cucumber, kale, lentils, Pita, red lentils. Bookmark the permalink.